Recognize and reward your long-term employees with quality service award pins. Whether you are looking for self-adhesive years of service awards or service pins with gemstones, Recognition Engraving & Awards has a wide variety of service pins and awards available. All service pins are in stock for immediate shipment. 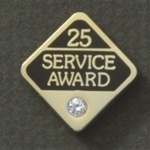 This service award lapel pin comes in every year 1 through 45, 50, 55 & 60. This service award lapel pin comes in every year 1 through 10 and in 5 year increments up to 60 after that. Choose the years you need and choose between a post/clutch or magnet back. These service award lapel pins have a magnet back instead of a post and clutch. Custom lapel pins made easy, with no die charges, a low minimum order and fast shipment! These years of service awards are small and self-adhesive - perfect for attaching to name badges or ID cards. Choose between four colors for the gemstones in these elegant service award pins. The rhinestones really add to the beauty of these service award pins. These beautiful Years of Service pins come with a white stone, and are offered in every year 1 through 40 years of service. 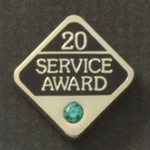 These Service Award Pins are set with a sparkling Swarovski Crystal. These Blue and Gold Years of Service Pins reward your employees' 5 year milestones. Choose from pens, clocks, paperweights, coasters, deskplates, plaques and more! Item #: P-70-01, 3/8" x 1/2"
Item #: P-99-01, 7/8" x 5/8"
discounts shown at the top of the page. Item #: P-99-MAG-01, 7/8" x 5/8"
Item #: P-70-10, 3/8" x 1/2"
Item #: P-99-10, 7/8" x 5/8"
Item #: P-99-MAG-10, 7/8" x 5/8"
Item #: P-70-11, 3/8" x 1/2"
Item #: P-99-11, 7/8" x 5/8"
Item #: P-99-MAG-11, 7/8" x 5/8"
Item #: P-70-12, 3/8" x 1/2"
Item #: P-99-12, 7/8" x 5/8"
Item #: P-99-MAG-12, 7/8" x 5/8"
Item #: P-70-13, 3/8" x 1/2"
Item #: P-99-13, 7/8" x 5/8"
Item #: P-99-MAG-13, 7/8" x 5/8"
Item #: P-70-14, 3/8" x 1/2"
Item #: P-99-14, 7/8" x 5/8"
Item #: P-99-MAG-14, 7/8" x 5/8"
Item #: P-70-15, 3/8" x 1/2"
Item #: P-99-15, 7/8" x 5/8"
Item #: P-99-MAG-15, 7/8" x 5/8"
Item #: P-70-16, 3/8" x 1/2"
Item #: P-99-16, 7/8" x 5/8"
Item #: P-99-MAG-16, 7/8" x 5/8"
Item #: P-70-17, 3/8" x 1/2"
Item #: P-99-17, 7/8" x 5/8"
Item #: P-99-MAG-17, 7/8" x 5/8"
Item #: P-70-18, 3/8" x 1/2"
Item #: P-99-18, 7/8" x 5/8"
Item #: P-99-MAG-18, 7/8" x 5/8"
Item #: P-70-19, 3/8" x 1/2"
Item #: P-99-19, 7/8" x 5/8"
Item #: P-99-MAG-19, 7/8" x 5/8"
Item #: P-70-02, 3/8" x 1/2"
Item #: P-99-02, 7/8" x 5/8"
Item #: P-99-MAG-02, 7/8" x 5/8"
Item #: P-70-20, 3/8" x 1/2"
Item #: P-99-20, 7/8" x 5/8"
Item #: P-99-MAG-20, 7/8" x 5/8"
Item #: P-70-21, 3/8" x 1/2"
Item #: P-99-21, 7/8" x 5/8"
Item #: P-99-MAG-21, 7/8" x 5/8"
Item #: P-70-22, 3/8" x 1/2"
Item #: P-99-22, 7/8" x 5/8"
Item #: P-99-MAG-22, 7/8" x 5/8"
Item #: P-70-23, 3/8" x 1/2"
Item #: P-99-23, 7/8" x 5/8"
Item #: P-99-MAG-23, 7/8" x 5/8"
Item #: P-70-24, 3/8" x 1/2"
Item #: P-99-24, 7/8" x 5/8"
Item #: P-99-MAG-24, 7/8" x 5/8"
Item #: P-70-25, 3/8" x 1/2"
Item #: P-99-25, 7/8" x 5/8"
Item #: P-99-MAG-25, 7/8" x 5/8"
Recognizing your long-term employees' contributions builds a stronger company culture by creating a sense of personal pride and setting standards for other team members to live up to. Regardless of the size of your organization or business, years of service lapel pins are a great way to help you on this mission of making employees feel significant and valued. For over 30 years, we've been helping companies recognize and reward their employees by providing a variety of service award pins. Available in a variety of style and design options, our years of service pins come with classic post and clutch options or magnetic and self-adhesive attachments. Pins with magnetic and self-adhesive attachments can be conveniently added to name tags, ID cards or badges. Add personalized touches with elegant rhinestones and gemstones, or sparkling Swarovski crystals. Our selection of service pins for employees includes bulk buying options with quantity discounts, as well as expedited shipping options. Pair your service award pins with one of our gift pouches or pin boxes to put your gift over the top! 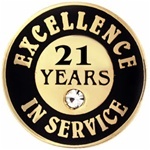 Browse our selection of in-stock service award pins or submit a quote request if you want to show your loyal employees your appreciation with custom years of service pins.